To me the movie was well-paced, taut, and featured a compelling love story between Moses and his wife Zipporah. And it showed the human price of becoming a Biblical icon: having to leave your wife and first-born son to “do your duty.” Finally, the Moses played by Christian Bale was more human, more like us today and therefore more believable. The film starts with Moses at the height of his military prowess. He’s a proud, self-sufficient warrior with little or no patience for the reading of entrails (see Haruspex – Wikipedia) or other religious superstitions of the time. But later on he “wrestles with the idea of God” after he finds out he’s actually the son of Hebrew slaves. Then too this more-human Moses has his times of great doubt, and sometimes feels abandoned by God. (Or at least that God isn’t there when he needs Him…) The Moses in E: G&K is unlike what we’ve been led to expect because he is so full of pride and stubbornness and self-doubt, just like we “mere mortals” are today. Which leads to two final points. First: To the icons that we choose to throw our cares and responsibilities on – like Moses – we followers are pretty much a pain in the neck. Second: Exodus: Gods and Kings is a pretty good movie and well worth seeing, if only in the interest of broadening your horizons. The lower image is courtesy of Victory O Lord! – Wikipedia, the free encyclopedia. For one thing, it didn’t mention Moses writing the first five books of the Bible, the Torah or Pentateuch. For another thing, it left out the part about Moses’ father-in-law “inventing the Supreme Court.” See On Jethro inventing the supreme court. 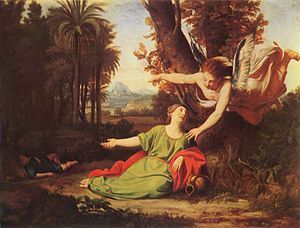 Third, the movie left out Zipporah telling Moses, “You are a bridegroom of blood to me!“ That was in Exodus 4:25, one of the “more unusual, curious, and much-debated passages of the Pentateuch.” See Zipporah at the inn – Wikipedia, the free encyclopedia. As they attempt to leave they realize that the club is surrounded by photographers and they will not be able to leave without being seen. Albert suggests going through the club’s dressing room and they dress Kevin in drag while Armand choreographs a dancing line through the exit and Kevin goes unnoticed. Even to the point where his driver; who had earlier betrayed the Keeleys to the press, didn’t recognize him. See also Object lesson – Wikipedia, the free encyclopedia. This entry was posted in Movie reviews, Not your Daddy's Bible on March 28, 2015 by bbj1969per@aol.com.